What is the least stressful way to get back and forth to work? Many Michiganders might say the car. Maybe it’s the individual climate control, the radio, the quiet time, or the perceived flexibility a car commute provides, but it is easy to see why many of us think this way. Despite what our auto-centric culture tells us, the car commute is stressful. A recent study by researchers at McGill University in Montreal looked at satisfaction of commuter preferences. Specifically, which mode is most enjoyable for commuters: driving, riding (bus and metro and commuter rail), walking or cycling? Approximately 3,400 commuters were asked to rate their satisfaction with various aspects of their travel to work during both the winter and summer. 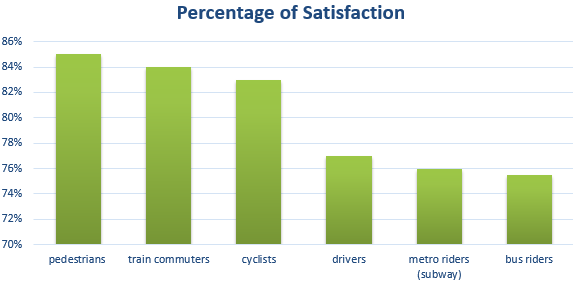 The researchers compiled the results into a single satisfaction score for each of six commute modes. Active transportation frequently ranks high among commuter satisfaction, likely due to the health and mental benefits that walking and biking provide. Train commuters ranked their commute notably more enjoyable than driving and other public transit modes – likely because of the opportunity for productivity that it provides. Commuter rail – often equipped with comfortable seating, free Wi-Fi and enough room to pull out your laptop or review that report – allows people to use travel time to get work done and spend more of their free time relaxing, spending time with family, or participating in hobbies. In Michigan, the average one-way commute time is 23.7 minutes, with Livingston county ranking at the top of the state average at over 31 minutes. That’s over an hour every day that is lost in transit (literally). Long, traffic-heavy daily commutes cause stress that can severly impact our physical and mental health. In a CNN interview, 26 year old commuter Dana Jones from Atlanta explains how stressful traffic can lead to road rage: “There were so many people out…You get road rage because nobody will let you in; nobody will merge right. It’s just aggravating.” A 2012 study in the American Journal of Preventive Medicine found that the farther people commute by personal vehicle, the higher their blood pressure and body mass index is likely to be. The proposed WALLY commuter rail could be a solution to reduce stress, increasing productivity, decrease overall commute time and create a more satisfying commuter experience. WALLY (also known as the North-South Commuter Rail) is a 27-mile commuter rail line planned to run between Howell and Ann Arbor for weekday service in the morning and late-afternoon rush hours. The project continues to move forward with leadership from the Ann Arbor Area Transportation Authority (AAATA), which will be commissioning a feasibility study to detail what exactly needs to be done to get the service up and running. If you’re interested in learning more about the WALLY project or better yet, would like to add your name to the list of supporters who want a productive, enjoyable option to get to work, contact the Friends of WALLY by email at FriendsofWALLY@gmail.com or find them on Facebook. The Detroit to Chicago route of Amtrak seems to be purposely designed to discourage commuting. Placing the morning origination and evening destination hub in Kalamazoo and Battle Creek for daily travel between Detroit and Chicago would provide a commuting service to both major cities. This plan would transform the Amtrak service from an occasional trip resource to a daily commuting resource and would greatly expand ridership on this route. This is also a model for all Amtrak routes, to place the origination and destination hub at the midpoint between two major cities.